The Ambassador Playa Hotel consists of two separate hotels, the Ambassador Playa 1 and the Ambassador Playa 2. offering a total of 460 rooms on ten floors and with four lifts. All rooms have a bathroom, television, telephone, air-conditioning and balcony. Facilities at the Ambassador Playa include 24 hour reception, restaurant, four bars, two outdoor swimming pools with children's sections, massage, whirlpool and pool table. Evening entertainment is provided which includes live music. Board basis available at the Hotel Ambassador Playa is half board or full board. Stayed at the Ambassador Playa Hotel in November 2007. Room clean and beds comfortable. Food ? Not too bad but could have been better. Restaurant too hot and too busy. Didn't try the hotel entertainment so can't judge on that. Cleaners pleasant and efficient. Clean towels when required. Reception staff not very helpful. After a nightmare journey from airport (took almost 3 hours with number of drop offs) we wanted to book taxi transfer back and did not get much assistance. We did find the location ideal. Close to all entertainment but we were not bothered by late night noise although we were usually ready for bed before midnight. All in all the hotel deserved it's 3 star rating. 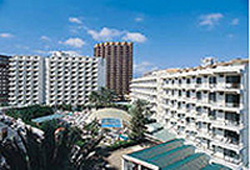 I think we were wasted by previous visits to the Levante Club Hotel which was absolutely first class.